Check out the latest Ace Hardware circular and sales flyer. The weekly ad is simple, easy to use and can save you money. Look through the ad and find the items you want to purchase. 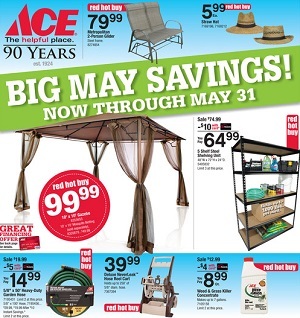 Find the latest Ace Hardware specials, coupons, deals, sales and offers on: Black & Decker AFS Electric Trimmer; Ace 50ft Heavy Duty Pressure Master Garden Hose; Living Accents 10ft x 10ft Gazebo; HGT Director Chair With Side Table; Husqvarna Push Mower; Weber Spirit SP-310 Gas Grill; Rubbermaid Patio Storage Bench; Igloo Breeze Max Cold Rolling Cooler; Yards & Beyond LED Bronze Mini Stake Solar Pathway Light; Kent 26″ Mens Shogun Trail Blazer Mountain Bike; Intex Metal Frame Pool Kit; Wenzel Dome Tent; Santa Fe Patio Seating Collection; Valspar Optimus Paint & Primer; Ames Premium Roof Top Coat; Dyson DC65 Multi Floor Vacuum; Delta Kate Series Pulldown Kitchen Faucet in Stainless Steel; Dewalt 20V Compact Lithium Ion Drill/Driver Kit; Makita 18V Compact Cordless Impact Drive Kit; Craftsman Heavy Duty Rolling Tool Cabinet; Craftsman 20 Gal Wet/Dry Vacuum; Perfect Aire Windows Air Conditioner; Honeywell Wi-Fi Programmable Thermostat; and more. Ace Hardware stores activate their weekly circular every month. Over 4,600 of Ace’s 4,700 stores around the globe are independently owned and operated by local entrepreneurs. They are small business owners who are local and loyal. Ace stores come in all sizes and shapes based on the needs of each individual neighborhood. Ace stores offer a wide variety of paint, lawn and garden, tools, local niche services and virtually anything you’ll ever need to fix, repair and maintain your home.